Violence between Israeli Defense Forces and Palestinian terrorist organizations in Gaza this week is prompting the usual outcry from Islamist groups in America and abroad. Rallies are planned in major cities throughout the United States Friday. Twitter feeds teemed with righteous outrage at what Islamists describe as Israeli aggression. Tunisia's ruling Ennahda Party issued a statement praising "the heroic Palestinian people and their steadfast struggle for their legitimate rights and continuous readiness to sacrifice all for that end." It also "strongly condemns the continuous Zionist savage crimes committed against our brothers and sisters in Gaza and throughout Palestine." Egypt's Muslim Brotherhood described Israeli strikes as "criminal aggression" done under the cover of American protection. 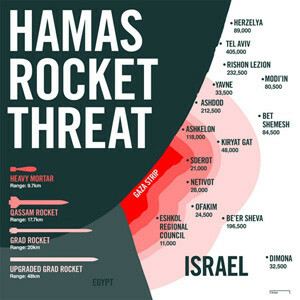 Nowhere do any of the organizations or activists mention the thousands of rockets Palestinian terrorists have fired from Hamas-controlled Gaza toward Israeli civilians. The pattern holds true among American Islamists. A statement issued Thursday from the Muslim Public Affairs Council (MPAC) illustrates this point. Israel "has escalated air and ground attacks against the Gaza Strip, killing Palestinian men, women and children," it says. "Israel is claiming these attacks are about going after militants, but in reality it's about assassination of Palestinian leaders, destruction of Gazan infrastructure and the gross killings of Palestinian civilians, including women and children." The statement offers no information to substantiate such a claim. Israel military officials, in contrast, have posted videos of one of their strikes, which targeted the longtime head of Hamas's military wing. Other posts show how rocket launchers are placed strategically amid civilian areas, creating unwitting human shields of nearby residents and increasing the chances for collateral casualties. MPAC mentioned none of this, but called on the United States to pressure Israel to back off and cast Israel as dictating policy for America. "Obama has four more years as the elected leader of our nation. Rather than capitulating to a foreign government that is bent on aggression, he should be meeting with human rights activists, religious leaders, student groups and the international community who are calling for the U.S. to stand up for America's interests against any and all human rights abuses." The statement makes no reference to Hamas or the Palestinian Islamic Jihad, and makes no call for the rocket fire to cease. This is nothing new. But if the concern truly is for the wellbeing of Palestinians in Gaza, condemnation of Hamas for placing them in harm's way seems in order. Similarly, American Muslims for Palestine (AMP), a group which has defended Hamas previously, issued a series of posts organizing protests Thursday and Friday in Chicago, New York, Los Angeles and other cities. Organizers of a rally in New York Thursday night include the Muslim American Society's New York chapter, Arab Muslim American Federation and Students for Justice in Palestine chapters. "Demand President Obama take action this time and pressure the Israeli government to end their attacks on the people of Gaza and end the illegal blockade of Gaza," an AMP release promoting the protests said. It does not appear to be working. White House Press Secretary Jay Carney told reporters Thursday that the United States lays the blame for the conflict at Hamas's feet. "Hamas claims to have the best interest of the Palestinian people at heart. Yet it continues to engage in violence that is counterproductive to the Palestinian cause," Carney said. "Attacking Israel on a near daily basis does nothing to help Palestinians in Gaza or to move the Palestinian people closer to achieving self determination." President Obama "reiterated the United States' support for Israel's right to self-defense" in calls with Israeli Prime Minister Benjamin Netanyahu and Egyptian President Mohamed Morsi, Carney added. Israel unilaterally withdrew from Gaza in 2005, but it did not impose a blockade there until 2007 after Hamas seized power there and started using the area as a launching pad for rockets aimed at southern Israel. Even the United Nations acknowledged the legitimacy of the attempt to stop the flow of arms to terrorists. "Israel faces a real threat to its security from militant groups in Gaza," a 2011 UN report says. "The naval blockade was imposed as a legitimate security measure in order to prevent weapons from entering Gaza by sea and its implementation complied with the requirements of international law." Netanyahu issued a statement to foreign media Thursday explaining why his nation decided to take more aggressive action to stop rocket fire from targeting its people. "No government would tolerate a situation where nearly a fifth of its people live under a constant barrage of rockets and missile fire, and Israel will not tolerate this situation," Netanyahu said. Under Hamas, Gaza has become "a terrorist stronghold. They fired thousand(s) of rockets at our cities, at our towns, at our civilians, at our children. They've smuggled thousands of rockets and missiles into Gaza, and they deliberately place these rockets and missiles in civilian areas: in homes, in schools, near hospitals. This year alone, they fired over one thousand rockets and missiles at Israel, including close to 200 rockets in the last 24 hours." Those rockets, including one which killed three Israelis Thursday, do not bear mentioning by American Islamists. The Council on American-Islamic Relations' (CAIR) New York Advocacy Director Cyrus McGoldrick even seemed to defend their use in a Twitter post Thursday. "Palestine is a land occupied by foreign settlers," he wrote. "They have a right to resist, to defend themselves 'by any means necessary.'" The AMP-organized protests also were promoted on the Twitter feed of Linda Sarsour, honored last year by the Obama administration as a "Champion of Change" despite repeatedly demonstrating rabid anti-Israel views. "Israel burns Gaza," wrote Hussam Ayloush, head of CAIR's Los Angeles office, on his Twitter feed. This continues a long pattern of blaming Israel for anything he can. "How long will Israel continue to hold the world hostage to its policies of occupation, blockade, assassination and apartheid?" he wrote in another post. A CAIR-New York board member, Lamis Deek, wrote that Gaza is a "beacon of resistance, [which] exposes shackles, awakens dignity, inspires revolution, reaffirms our oneness~ the reason 'israel' won't last." This situation provides a stark, clear truth about these groups' true colors: for all their talk about peace and countering terrorism, their decision not to speak out about the rocket attacks demonstrates what they really believe. They'd be happy if Israel disappeared off the face of the earth.